Cauzway© is successful in implementing both small affordable systems and large distributed systems. In NYC for example, we are installed in brownstone buildings with only 4-6 apartments. We are also widely deployed in large high-rise buildings and urban complexes with 100's of apartments. Cauzway© gives the integrator the advantages of fast, clean and reliable installations while affording the end-user lowered long-term cost of ownership. Cauzway© is used in new and existing building management systems for energy monitoring and control using the following wireless devices:. 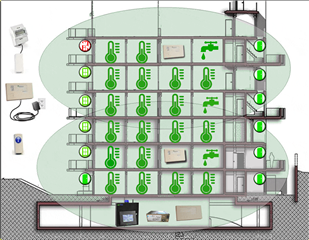 Cauzway© offers wirelss transmitters and Intelligent Bridge workls are designed to interface with all commercial and industrial HVAC monitoring systems.